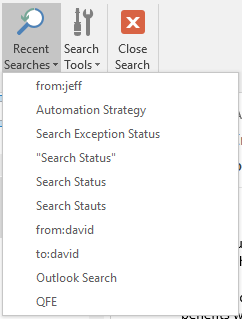 Microsoft is continuing our investment in Outlook Search and Query Formulation. We are investing in the look and feel, increasing stability and reliability, and adding greater intelligence to the results. As part of making improvements to the core search experience, we are in the process of changing and removing some related search experiences which show little usage, and cannot be updated to take advantage of the new benefits we are building into our core search workflow. We've listened to your feedback around which features are working well and which feel broken. To that end, we have removed the Expanded Find Pane, and Recent Searches ribbon button. Recent searches are still available through the search box suggestions. [Updated] We've heard the user feedback and Advanced Find is re-enabled for all users. We're using the feedback to bring the power you love from Advanced Find to all users. Thanks to all those who provided feedback. To find which folder a mail is located in, hover over it in the search results. Optionally, change the view to "Preview" under View Settings. This will update the message view to be in a table format. By modifying the View Settings, it's possible to add the "In Folder" column. This can help to quickly identify what folders emails are located in.